Mundubbera (/mʌnˈdʌbərə/ mun-DUB-ər-ə) is a town in the Wide Bay–Burnett region of Queensland, Australia. 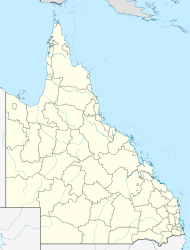 The town is located on the Burnett Highway, 405 kilometres (252 mi) north west of the state capital, Brisbane and 200 kilometres (120 mi) west of the regional centre, Bundaberg. Mundubbera is built on the bank on the Burnett River. At the 2001 census, the town had a population of 1,053. Mundubbera is the self-proclaimed "Citrus Capital of Queensland", although this is disputed by the neighbouring (and rival) town of Gayndah. Mundubbera means either Footsteps in the trees or Meeting Place of the waters in the local Aboriginal language. The latter name refers to the confluence of the Burnett, Auburn and Boyne rivers just upstream from Mundubbera. European settlement took place in the late 1840s. Closer settlement, involving migrants from Germany, Britain and the Netherlands, did not take place until the early 1900s and the town was established in its existing site prior to World War I. The railway arrived in 1914. Mundubbera Post Office opened by 1 July 1912 (a receiving office had been open from 1911). The Mundubbera War Memorial commemorating those from the district who served in World War I was unveiled by the Member of the Queensland Legislative Assembly for Brisbane and Minister for Works, Mick Kirwan, on 27 May 1928. Henry Zipf planted the first citrus orchards in 1933 and established Mundubbera as a major producer of export citrus. The recent (2006) drought and the after effects of the 2004 Citrus canker outbreak in Emerald has had a dampening effect of the citrus industry in the area. The Mundubbera Vietnam Veterans Memorial commemorates those who served in the Vietnam War. It is located beside the RSL Memorial Hall. On 11 November 1995, members of the RSL planted a Lone Pine war memorial tree from a seedling whose lineage links back to Gallipoli. A library was established in Mundubbera in December 1933 in the School of Arts. The Mundubbera district is bounded on the east by the Binjour Plateau and on the south and west by the Burnett River. Devonian, Carboniferous, Triassic, and Post-Triassic sediments have all been found in the district. Devonian and Carboniferous sediments are incorporated into the late or post-Permian folds which affect the Yarrol Basin. A large syncline is exposed, commonly called the Mundubbera Syncline. Folded Triassic strata are found in the western part of the district in a fault block. There is evidence of Tertiary or post-Triassic sediments in horizontal sandstone. Near Riverleigh, fossil corals were found in limestone during the 1920s. These were studied by Dorothy Hill of the University of Queensland. At the 2001 national census there were 1,053 persons resident in Mundubbera, 6.1 per cent of those of Aboriginal or Torres Strait Islander ancestry. 8.2 per cent of Mundubbera residents were born overseas. Industry in Mundubbera is entirely based around agriculture and forestry. The major agricultural activities in Mundubbera are cattle grazing and, in the irrigated areas, fruit growing. Fruit grown in the Mundubbera area includes citrus, mangoes, avocadoes and stone fruit. In addition, Mundubbera is Queensland's largest producer of table grapes. During the fruit picking seasons Mundubbera can double in size as many itinerant workers and backpackers from around the world come to the town looking for work on the orchards. Seasonal workers are accommodated in two large caravan parks in Mundubbera itself or in many on-site parks. Since 2010, workers from Tonga and Papua New Guinea have been supported through the Pacific Seasonal Worker Pilot Scheme. The success of this endeavour has meant that the Seasonal Worker Program will be fully operational from 1 July 2012. Supporting the fruit industry are businesses such as a fruit juice processor and several packing sheds. *Bugs for Bugs, an integrated pest management business, raises insects that act as a biological control for common fruit pests, allowing less chemical insecticide use. With large areas of State forest in the shire, Mundubbera also has a large timber industry with a mill in Mundubbera town. Other industries include piggeries and dairying. Commercial activity is limited, and consists mainly of small businesses supporting local residents and farmers. The town has two hotels, two motels and an IGA supermarket, plus the usual small town services such as a butcher, baker, newsagency, post office and a public library open to the general public. The town is about 1 kilometre (0.62 mi) south of the intersection of the Burnett Highway and the Mundubbera-Durong road. The Burnett Highway links Mundubbera with Gaydah and Goomeri to the east; and Eidsvold, Monto and Biloela to the north. The Mundubbera-Durong links Mundubbera to Dalby and Toowoomba in the Darling Downs. This road is single lane bitumen in places. Public transport is limited. In 2005 the only public transport servicing Mundubbera had was a bus service operating once a week on Thursdays to Bundaberg and on Wednesdays and Fridays to Maryborough. An active rail link from Mundubbera to Maryborough and the coast was maintained with the line no longer having a passenger service, however in 2012 Campbell Newman, the Queensland Premier, announced that the line would no longer be looked after. Mundubbera is host to a limited range of primary and secondary school facilities. Primary schools in the area include the small school cluster of the rural schools of Boynewood SS (opened 1915), Binjour Plateau SS (1913), Monogorilby SS (1936) and Riverleigh SS (1914); Riversleigh SS was closed at the end of 2009 due to lack of enrolment. The main school in Mundubbera is the Mundubbera P-10 school, offering education from Prep to year 10. Mundubbera originally had a Pre-school but following the introduction of prep this has been converted into a music room. High school students wishing to complete Years 11–12 must either attend Burnett State College (formerly Gayndah State High School), 45 kilometres (28 mi) to the east in Gayndah or attend boarding schools in Brisbane, Toowoomba or Rockhampton. The North Burnett Regional Council operates a public library in Mundubbera at 30 Lyons Street. The Muundubbera branch of the Queensland Country Women's Association meets at 79 Lyons Street. The 360-degree mural showing the joining of the three rivers at Mundubbera. The nearby Auburn River National Park is a good location to find Queensland Lungfish (Neoceratodus forsteri), known locally as Ceratodus, a rare living fossil found only in the Burnett and Mary Rivers. This park is popular with bush walkers and rock climbers. It features cascades, great swimming spots, caves, balancing rocks and superb scenery. The town lookout on the entrance to town on the Burnett Highway is home to a Black stump, to symbolise Mundubbera's location on the edge of the Outback. Mundubbera is the home of the Big Mandarin, a larger than life fibreglass model of an Ellendale Mandarin that doubles as a kiosk for a local caravan park. It is one of many "Big" tourist attractions that dot the Australian landscape. The Meeting Place of the Waters 360-degree mural painted on the sewerage pumping station is a visual tribute to the rivers that provide Mundubbera with its prosperity. Mundubbera hosts a popular seven-a-side cricket tournament in February each year. The Mundubbera Fish stocking association hosts a popular fishing competition. The towns annual agricultural show occurs on the second Friday and Saturday of May each year, at the towns Show Grounds, amongst other events, it features a rodeo, cattle judging, chicken judging, and art and food judging, campdraft events, as well as a side show alley. Until recently the Rugby league teams of Mundubbera and Gayndah would play-off in the State of Oranges, a pun on the State of Origin series between New South Wales and Queensland that recognised the strong but friendly rivalry between the two towns. This match has been reinstated and will be played on the Queen's Birthday Weekend in June. The Mundubbera Bullarama committee runs an annual Rodeo in September, which attracts bull riders from around Queensland. Usually held at the towns show grounds, but in 2007 the event was held at the Scampers Grounds, an area also containing the towns Motocross Track, and 6 cricket ovals that hold a large portion of the seven-a-side cricket tournament. Mundubbera has a motocross track regarded by some as the best natural terrain track in Queensland, it holds several meets each year, in series such as the Thundercross Series. Mundubbera celebrated their centenary on the weekend of the 24 and 25 March. Former Queensland Premier Wayne Goss was born in Mundubbera. Australian Test Cricketer Martin Love was born and raised in Mundubbera. Olympic-level equestrian rider and gold medalist Stuart Tinney was born in Mundubbera. Author and cook Kim McCosker was raised in Mundubbera. Queensland and Australian Lawn Bowls Champion Kurt Brown was raised in Mundubbera.Brown has amassed an impressive 12 QLD titles and 1 Australian Title. He has represented Queensland on 126 occasions and also trialled for the Commonwealth Games Lawn Bowls Team. ^ Australian Bureau of Statistics (27 June 2017). "Mundubbera (State Suburb)". 2016 Census QuickStats. Retrieved 29 January 2018. ^ Australian Bureau of Statistics (25 October 2007). "Mundubbera (Urban Centre/Locality)". 2006 Census QuickStats. Retrieved 25 October 2007. ^ Google search for "Citrus Capital of Queensland". Accessed 14 October 2006. ^ Premier Postal History. "Post Office List". Premier Postal Auctions. Archived from the original on 15 May 2014. Retrieved 10 May 2014. ^ "Mundubbera War Memorial". Monument Australia. Archived from the original on 7 April 2014. Retrieved 5 April 2014. ^ "BOYNE RIVER". The Brisbane Courier. National Library of Australia. 28 May 1928. p. 16. Retrieved 6 April 2014. ^ Queensland Department of Primary Industries and Fisheries Archived 27 September 2006 at the Wayback Machine. Retrieved 1 October 2006. ^ "Vietnam Veterans Memorial". Monument Australia. Archived from the original on 7 April 2014. Retrieved 6 April 2014. ^ "Lone Pine Memorial". Monument Australia. Archived from the original on 7 April 2014. Retrieved 5 April 2014. ^ "MUNDUBBERA". Maryborough Chronicle, Wide Bay and Burnett Advertiser (19, 651). Queensland, Australia. 27 October 1933. p. 4. Retrieved 16 January 2018 – via National Library of Australia. ^ Driscoll, Egbert G. (1960). "Geology of the Mundubbera District" (PDF). Papers. University of Queensland. Department of Geology. 5 (5): 1–27. Archived (PDF) from the original on 26 November 2016. Retrieved 26 November 2016 – via UQ eSpace. ^ Hill, Dorothy (1934). "The Lower Carboniferous Corals of Australia". Proceedings of the Royal Society of Queensland. 45 (12): 63–115. Archived from the original on 15 October 2018. Retrieved 14 January 2018 – via Biodiversity Heritage Library. ^ Australian Bureau of Statistics (9 March 2006). "Mundubbera (S) (Local Government Area)". 2001 Census QuickStats. Retrieved 30 June 2007. ^ Queensland Department of State Development. Accessed 2 October 2006. ^ a b c d "Opening and closing dates of Queensland Schools". Queensland Government. Retrieved 18 April 2019. ^ Mundubbera deserves better Archived 30 September 2007 at the Wayback Machine A campaign for Year 11 and 12 at the Mundubbera School. Accessed 1 October 2006. ^ "Mundubbera Library". Public Libraries Connect. Archived from the original on 16 January 2018. Retrieved 16 January 2018. ^ "Branch Locations". Queensland Country Women's Association. Archived from the original on 26 December 2018. Retrieved 26 December 2018. ^ ABC Wide Bay Website. Archived 23 May 2006 at the Wayback Machine Retrieved 1 October 2006. ^ Ben Turnbull (16 October 2012). "Love holds tight in tense final". Sunshine Coast Daily. Archived from the original on 11 August 2014. Retrieved 4 August 2014. This page was last edited on 19 April 2019, at 00:23 (UTC).